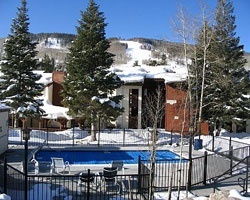 Apollo Park at Vail offers rustic ski resort condominiums about 100 miles west of Denver. Beautiful scenery, bountiful activities, and unrivaled resorts combine to create the ultimate Colorado Rocky Mountain escape all year round. Whether you're seeking Colorado family fun, a romantic weekend, an outdoor adventure, or excellent shopping, it's all here. Guests may enjoy skiing, ice-skating, golf, and horseback riding, as well as fine dining and nightlife all within walking distance or a short drive. No matter what you're looking for in vacation getaway, Vail has it all! Beautiful year round mountain resort! Annual week 26! Buyer may receive a title fee credit, inquire for details!